President of the Republic of Azerbaijan Ilham Aliyev has received a delegation led by head of the Karachay-Cherkessia Republic of the Russian Federation Rashid Temrezov. 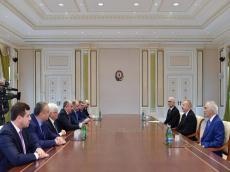 The head of state hailed the successful development of Azerbaijan-Russia bilateral relations in all areas. He pointed to high level of mutual trust between the two countries’ presidents which plays a particular role in expanding bilateral relations. President Ilham Aliyev also noted that the Republic of Azerbaijan’s close cooperation with various regions of the Russian Federation, as well as the North Caucasus region, including with Karachay-Cherkessia Republic, the people of which share common historical and cultural values, contributes to the development of Azerbaijan-Russia relations. The head of state noted the importance of the 9th Azerbaijan-Russia Interregional Forum, held last year in Baku with the participation of the two countries’ presidents, in successful development of relations between various regions of Azerbaijan and Russia. President Ilham Aliyev expressed his confidence that Rashid Temrezov’s visit to Azerbaijan will be fruitful and successful. Hailing their meeting with the Azerbaijani President, head of the Karachay-Cherkessia Republic of the Russian Federation Rashid Temrezov pointed out the role of the interregional collaboration in development of the Azerbaijan-Russia bilateral relations, and emphasized the importance of the meeting to be held today between the business representatives in Baku.